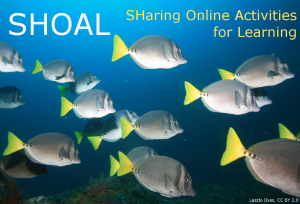 The SHOAL project (SHaring Online Activities for Learning) aims to make it easier for staff to discover and be inspired by online learning activities developed in Oxford, and incorporate them into their teaching. By expanding digital learning opportunities, SHOAL will enable students to boost their skills at a time and place to suit them. We will develop a WebLearn portal which allows users to search for relevant resources, either as learners (staff and students) or teachers (academic staff, post-docs and graduate students). We will explore models of access that allow fee-paying and copyrighted resources to be shared in a financially sustainable way. Our team unites expertise in creating innovative and interactive online learning activities for STEM (Dr Jocelyne Hughes at Continuing Education and Dr Lucy Tallents at Zoology) with expertise in WebLearn use and development (Adam Marshall and colleagues at IT Services). We seek academics who want to encourage wider use of their own online resources, or who are curious about the potential of online tools and want to see how others are using them. This pilot project will work with partners in MPLS, but academics from all divisions are welcome to explore the portal. We would also love to hear from students who want to try out different online activities and learn new skills. Help us to test the portal in February, and be amongst the first to try out these shareable resources! To express your interest in the project, please contact the project leader Lucy Tallents (lucy.tallents@zoo.ox.ac.uk) with the subject line ‘SHOAL’. Keep up to date with our progress by reading our SHOAL blog posts.